These are amusing enough that I’ve just made them for the third time. Not my idea. I’ve reconstructed the method from a glimpse of a picture some years ago. 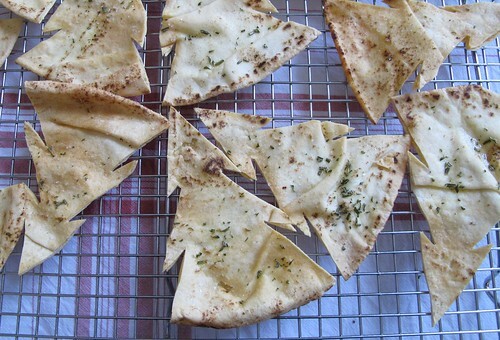 Take flat breads, these are done with Lebanese bread. Cut into 6-8 wedges. Snip off the bits that stop them looking like trees (kitchen scissors are the easiest tool for this). Lay on oven trays. Brush with olive oil, sprinkle with salt and finely chopped rosemary. Bake in ~160C oven for 10-15min until dry. Cool on racks. Bag up until wanted. I make them to serve with pate, but they are just flavoured crackers really so eat them with what you wish. The offcuts were tossed with olive oil, spread on an oven tray, sprinkled with a spice mixture and similarly baked until dry and a bit browned. In this case I used cumin, coriander, salt, pepper, chipotle powder, sweet paprika, celery seed. We will eat these as a crispy snack with drinks tonight. A gratuitous shot of my beautiful Maurice* who’s flowers were gracing the table. *”Maurice Utrillo” A glorious scented and striped rose from Delbard’s Painters range of roses.